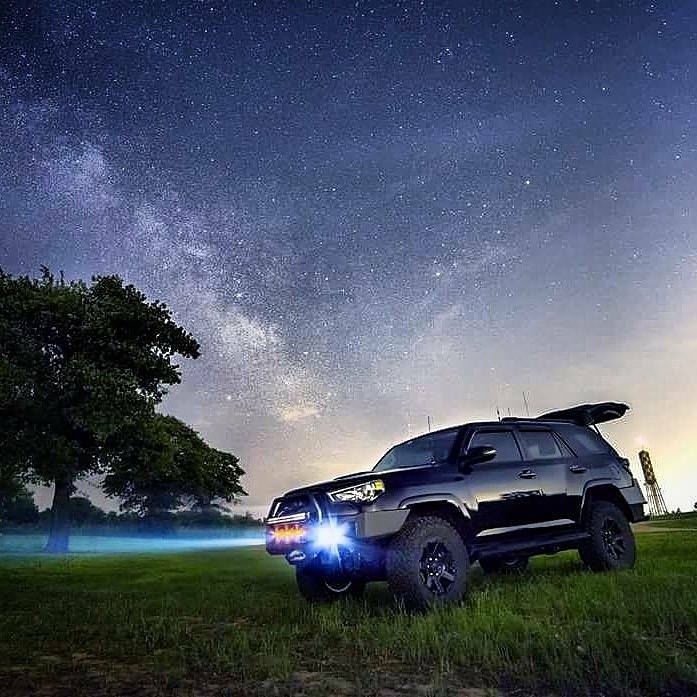 I wanted to get some off road lights for my chase ride… So many times I’ve been on a dark back road at night and just wanted to add some light.. I’ve also been in search and rescue situations where added light would have been amazing.. So I looked into lights.. Which led me to maybe mounting them on a brush guard or something, since my 4Runner didn’t have much for mounting options in the grille, without some expensive grille LED kit ($1000), so I figured if I am going to spend big money like that, why not get a full bumper with some protection?? Through Facebook I cam upon a guy from Lubbock, TX named Thomas Adams, who owns a steel fabrication shop called Fearless Fabrication. I heard he did some other chasers rides so I figured I would message him.. After looking at his work I could see he was an innovator and was really good at making things work. We talked ideas, numbers etc and decided on a time to take it down there. His prices seemed incredibly reasonable and his reputation was great, so it was time to beef up the ride! I’ll talk about each component and cost through the blog. Front Bumper/Grille Guard/Skid Plate: I had a few ideas going into this, but I really just let him be creative and take it however he wanted from the start. The skid plate was a late addition but definitely glad to have it. Rear Bumper: He talked me into this on arrival. We were discussing how so many accidents are from being rear ended, so I said, sure, go for it. He made it look awesome with lighted steps, too! Now I can stand there and look over my car at storms! Winch: Went with a 10,000 lb wireless winch. I made sure to get a very well reviewed, water sealed SmittyBuilt winch. It looks and sounds mean! LED’s: Went with Rigid LED lighting, of course! I have DOT approved LED fog lights in front, and also LED flood lights that light up with the 30″ light bar. Cost: Everyone wants to know that of course… The steel work, labor, parts etc was $3500. Add in LED’s and Winch, for about another 1800.. So about $5300 out the door. It looks sweet though! ← Amazon Prime Day.. Bad Chat Support.. Scam?